A hot new .30 and a 7mm join the ranks of beltless magnums. Remington's answer to Winchester's .300 Short Magnum is a .30 of their own--plus a 7mm. Officially designated as the Remington SA (for short action) Ultra Mag, it heralds the beginning of cartridges based on a shortened version of the Ultra Mag case. The rationale is of course the same as that which spawned Lazzeroni's Short Action Magnums and the .300 WSM; namely, cartridges that can ballistically match the now old-fashioned longer-bodied belted magnums, and do it with less powder and in short-action rifles. What do we have here in these SA Ultra Mags? Obviously, they are but shortened versions of the full-length Ultra Mag hull. As such, it is a beltless case having a nominal head diameter of .550". For those of you interested in such things, that's officially .006" larger than the old .404 Jeffery case, and .005" smaller than the .300 WSM. I suppose that enables both companies to claim that their offspring is unique and not based on any pre-existing case. Like the parent Ultra Mag hull and Winchester's Short Magnum, the rim of these Remington shorties is rebated to .532" to match that of the conventional belted magnum so that a new bolt face configuration isn't needed. In a side-by-side with the .300 WSM we find the Remington case to be 1â„8-inch shorter in body and in overall length, and to have a 30- rather than a 35-degree shoulder. The result is a vessel of 7.5 percent less volume than the WSM. Nonetheless, Remington is claiming virtually the same nominal velocities for their short .30 as Winchester does for theirs, i.e., 2,960 fps for a 180 gr. bullet versus 2,970 for the WSM. How 'dey do 'dat? Well, it's the kind of smoke and mirrors thing that advertising and marketing guys are paid to come up with. We all know that, all other things equal, a case having 7.5 percent less volume shouldn't be able to match the larger one performance-wise. That's not an absolute, mind you, because funny things can happen when you increase case capacity to ludicrous proportions relative to bore diameter, but in this instance we're talking well-balanced cartridges of moderate (by today's standards), powder capacity. Essentially, how Remington is able to match the larger-cased WSM is by using a bullet that takes up roughly 7.5 percent less space than the Winchester Fail Safe bullet they've chosen to compare it against. In conjunction with the introduction of these two short magnums, Remington also introduced a new premium-grade bullet. Called "Core Lokt Ultra," this new projectile is shorter and thus infringes on the combustion chamber to a lesser extent than does your typical premium bullet. You see, other premium-type bullets designed for high weight retention like the Nosler Partition, Swift Scirocco or Winchester's Fail Safe--have less lead than bullets of conventional construction (a Hornady Spire Point or Sierra Game King are good examples). As a result, they are physically longer than similar-weight slugs of conventional design. The 180-gr. Fail Safe bullet used in Winchester's Supreme .300 WSM load is about 1â„8-inch longer than Remington's Core Lokt Ultra, so when loaded to the same overall length and an optimum load is developed for each, the volumetric edge of the WSM case is essentially negated. With a Barnes' X bullet, which has no lead in it whatsoever, this situation is further exacerbated in short-action calibers. The same holds true for bullets like the Nosler Ballistic Tip and Hornady's SST. Because these bullets have polycarbonate tips up in the nose section instead of lead, they are longer than conventional design bullets of equal weight. Remington again takes advantage of this fact by using their .30 cal. Core Lokt Ultra 150-gr. bullet in a comparison with the same weight Ballistic Silvertip load for the WSM. The latter has to be seated about 1â„8" deeper into the case which, in effect, reduces case capacity. This new Core Lokt Ultra bullet is of conventional design in that it has a cup-type copper jacket and a solid lead core. However, the thickness in the jacket's mid-section has been increased by 50 percent, and 20 percent overall. Moreover, once the solid lead core has been inserted into the jacket, an electrode is applied that melts the core and metallurgically fuses it to the jacket. Remington is claiming over 80 percent weight retention for its Core Lokt Ultra bullets. And because the melting of the core eliminates voids, a high degree of accuracy is being claimed as well. By using other selective comparisons, Remington is also claiming flatter trajectories for their new short 7mm and .30 cal. offsprings. By comparing, for example, the 180-gr. Core Lokt Ultra load in the SA magnum with their own .300 Win. Mag loading using the standard Core Lokt bullet, they can claim a one inch flatter trajectory at 500 yards. How? The Core Lokt Ultra bullet has a higher ballistic coefficient than the regular Core Lokt (.402 compared to .382). Though I fully expect Winchester to announce a 7mm version of their short magnum by year's end, they don't have one as of this writing, so we can't make any comparisons. However, in comparing the 7mm SA Magnum with their own 7mm Rem. Mag, again using the Ultra bullet in the former, and a regular Core Lokt in the latter, the stubby round has the same 2,960 fps velocity in the 160-gr. loading, and a two inch flatter path at 500. And it's all done using 12 percent less powder. And so it goes. In selective comparisons, the smaller-cased SA Ultra Mags can be shown to equal or surpass the performance of Winchester's Short Magnum, the .300 Winchester Magnum, and its own 7mm Rem. Mag. But again, all other things equal, loading the identical bullet in both short cases, the larger WSM has the potential to surpass the performance of the SA Ultra every time. Do keep in mind, however, that we're splitting hairs here. And that goes for factory ammo and handloads alike. The differences aren't enough to stick in your eye, but they're important from the advertising standpoint. Not only was the mid-year introduction of these new cartridges and bullet highly unusual for Remington, so too was the fact that I actually had a test rifle in 7mm SA Ultra in my hands within a week after returning home from Madison, and the ammo just a few days after that! I can't tell you how rare that is! The rifle sent me was one of several that had been available for shooting at the press conference the week before. It all could not have worked out better for me because this all happened just three weeks before I was to leave for a plains game hunt in the Kimberly region of South Africa. Since neither Browning nor U.S. Repeating Arms anticipated shipping A-Bolts or Model 70s in .300 WSM before my scheduled departure, I had long since committed to take an H-S Precision Pro-Series 2000 rifle on this hunt. H-S had begun chambering for the .300 WSM shortly after it was officially announced at the last SHOT Show, so I knew I'd have one of them in time. I couldn't pass up this opportunity, however, so I plan to also bring the SA Ultra Mag with me as well, along with the new 140-gr. Core Lokt Ultra load to field test. 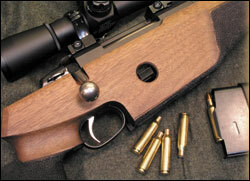 Only two Remington rifles are being chambered for the SAUMs this year, and both are Model Sevens. Officially designated as the Model Seven Magnum, the one I've got is the SS version with an all-stainless, sightless barreled action in a black, injection-molded stock. The other option is the LS, which sports a blued barreled action with sights, set into a brown laminated stock. Nominal weight for both guns is said to be 71â„8 lbs. My rifle came with a Leupold Compact 3-9x scope already mounted and weighed 81â„4 lbs. field ready. Oddly enough, both models come with a 22-inch barrel as standard, so for this year anyway, no production Remington will be capable of extracting the advertised muzzle velocity in either caliber. To keep the rifle at a sensible weight for what are essentially 7mm and .300 magnum rifles, the barrel measures .700 at the muzzle, which is quite stout by pseudo-carbine standards. Those wishing for a 24-inch barrel can either order the Model Seven AWR through the Custom Shop, or wait 'til next year when Remington will add both chamberings to several models in the 700 line. The AWR is distinguished by its Aramid fiber-reinforced fiberglass stock and Teflon-coated stainless barreled action. All three models feature three-round magazines with hinged floor plate. The MSRP on the Model Seven Magnum SS is $719 in either caliber; for LS it's $673. The AWR out of the Custom Shop is $1,257. As this is written I have but three days before I leave for Africa and I've had precious little time to spend with the gun. Nevertheless, I have managed three short range sessions with it using the limited amount of ammo sent me--less than five boxes, in fact, and I'm saving two of them for the hunt. I was promised loading dies would be shipped with the gun, but alas, that hasn't happened. It's no biggie, though, 'cause I want to use the new Core Lokt Ultra bullets, so I'm limited to using factory ammo in any case. So far, only data for the 160-gr. Nosler Partition load is given. I, however, have received only the 140-gr. Core Lokt Ultra loads for which velocity data has yet to be published. I presume, however, they will be claiming to at least match the 140 gr. 7mm Rem. Mag loading of 3,175 fps. Indeed, the 10-shot string of factory ammo I put through the test gun averaged 3,135 fps through its 22-inch barrel. Considering a certain velocity loss of 50-60 fps for the two-inch shorter barrel, the loads I'll be using in Africa actually exceed 7 Mag performance. I hasten to add, however, that this is pre-production ammo I'm using and it's a little on the warm side. Bolt lift is a bit stiff, and there's a slight flow of brass into the ejector hole that's slightly burnished by bolt rotation. I'm guessing production ammo will be further refined to produce less pressure at or near the targeted velocities. Remington's Ammunition Products Manager, John Chisnall, tells me that thus far a ball propellant similar to W-760 has worked best in the SAUM's. In the 140-gr. Core Lokt Ultra load I've got, there's a 60-gr. charge. Do not interpret this to be loading data; I'm only reporting that there is a charge of 60 grs. of an unknown ball propellant in this particular factory load. It's always interesting to compare the efficiency of these new short magnums like Lazzeronis, the Winchester, and now the two Remingtons, with larger-cased equivalent calibers. Take the equally new, magnum-length 7mm Ultra Mag introduced just a few months before the SA version, for example. The former requires a propellant charge of 90 grs. to push a bullet of 140 grs. to 3,425 fps. That means, to achieve a little over a seven percent increase in velocity over the SA version requires 50 percent more powder, to say nothing of double the recoil, a barrel life measured in hundreds rather than thousands of rounds, and the extra length and weight of a magnum action. With Remington having thrown its hat into the short action magnum arena, it can definitely be said that this new direction is not just a flash in the pan; it's going to change forever how future generations of hunters and shooters perceive sporting cartridges. And it won't stop here. Look for Winchester to introduce a .338, a 7mm and/or a .270 version of their WSM, and Remington to also add a .338, as well as something smaller than 7mm, perhaps a .25 or 6.5. Yep. It's all going to be verrr-ry interesting!